I just finished The Shallows. What the internet is doing to our brains. by Nicholas Carr. It was a great book. 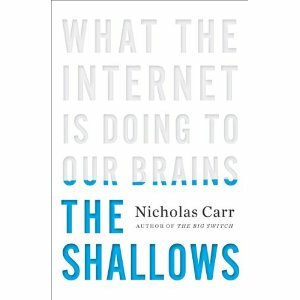 Nicholas describes the impact that the internet has on the brain. He explains the brain, technology, a little bit of neuroscience, a great history of the development of technology and it’s impact on culture, society, and the mind. I know, not much of a review – but you’re going to have to buy the book for yourself. I’m going to read it again, not just because it will help me with my research, but because it’s just that good. If you’re interested in the way that technology and media has an affect on you and your brain – you have to buy this book. Whether you are a researcher, an educator, or just someone that is interested in the Net’s impact on you – go and get it. I’m sure Nicholas wouldn’t mind.